For the longest time, I wasn’t getting that effect. 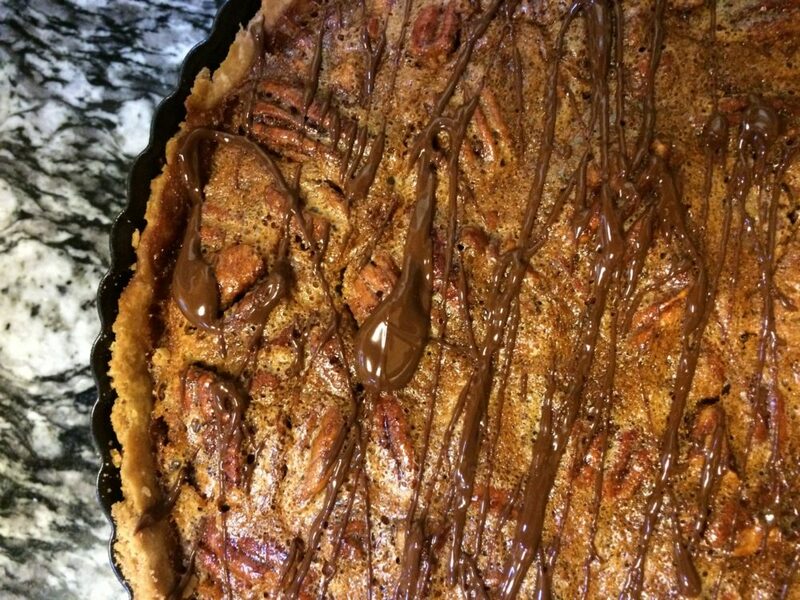 I’d follow every recipe perfectly, measure all the ingredients, and still I’d have crumbly, fall-apart dough that I’d have to piece together in the pastry tin. Then, I came across a post on Jamie Oliver’s site. In his instructions, he specifically tells us to use our hands. A lightbulb went on in my head. 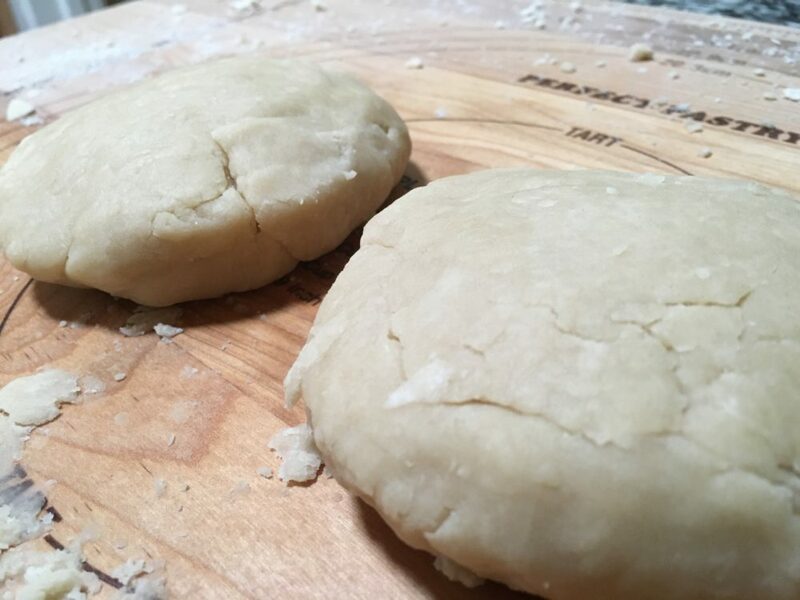 As much as I like to hold and work with pastry between my fingers, I had been using a stand mixer, a pastry cutter, or two forks every time I made my dough base. But that’s not personal. There’s no human touch or connection, no love in what I was doing. So I started using my hands. Amazing. I can better control the butter-flour crumbing process. I can feel when the dough has come together. I’ve been able to produce consistently flawless pastry every single time: it rolls out like a dream, falls right into the pastry tin, and bakes short, buttery, flaky crusts. Yum. See below the recipe for a few extra pastry tips and tricks! Produce consistently flawless pastry every single time. This recipe rolls out like a dream, falls right into the pastry tin, and bakes short, buttery, flaky crusts. optional: seasonings such as lemon zest, cinnamon, cocoa powder, etc. Sift the flour and sugar together onto a clean work surface. 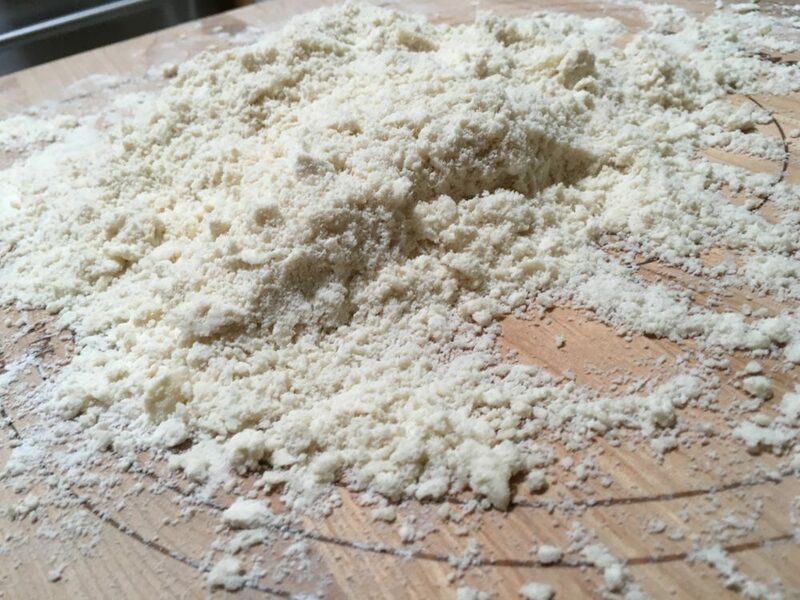 Using your hands, work the cold butter cubes into the flour/sugar mixture by rubbing your thumbs and fingers together until the mixture resembles a fine crumb. Sieve the flour from a height on to a clean work surface and sieve the icing sugar over the top. Using your hands, work the cubes of butter into the flour and sugar by rubbing your thumbs against your fingers until you end up with a fine, crumbly mixture. If adding additional seasoning, work it into the crumb mixture here. Still working with your hands, add the eggs to the crumb mixture. Add the milk a little bit at a time until the mixture comes together and forms a ball of dough. Flour your work surface and place the dough on top. Form the dough into the general shape of the pastry you want to create (if making a pie or tart, pat into a flat round shape; if making a rectangular or square tart pat into a flat rectangular or square shape). Flour the dough lightly, wrap it in plastic wrap, and put it into the fridge to rest for at least half an hour before using. The result really should be a fine-grained crumb. This is what will help the butter distribute evenly and consistently when you roll out the dough. 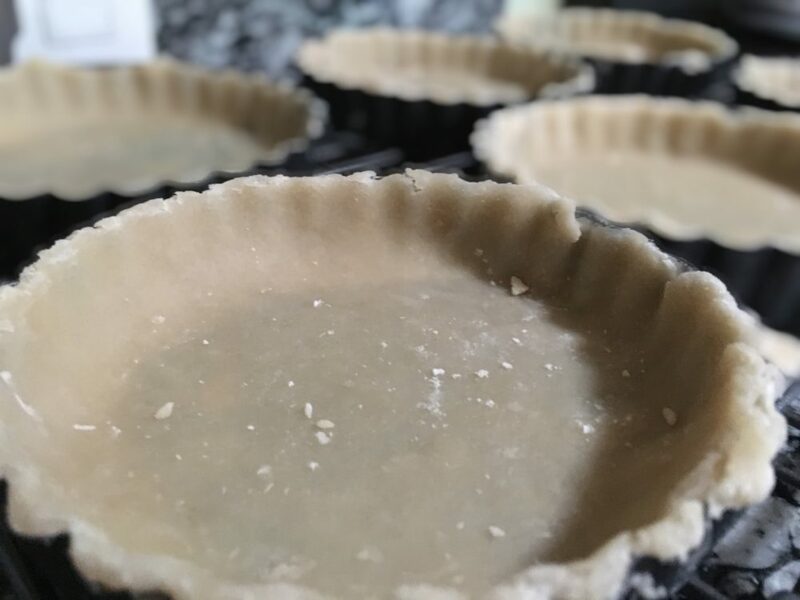 If there are large chunks of butter about, the pastry will come out patchy, won’t roll out into a smooth sheet, and you’ll definitely have trouble putting the dough in the pastry tin. Resting the Dough: After adding the ice water and making your beautiful dough, wrap it in plastic wrap and let it rest in the fridge. I find that best thing to do is to rest it in the relative shape of the kind of pastry you intend to make. Create round disks if making a circular pie. 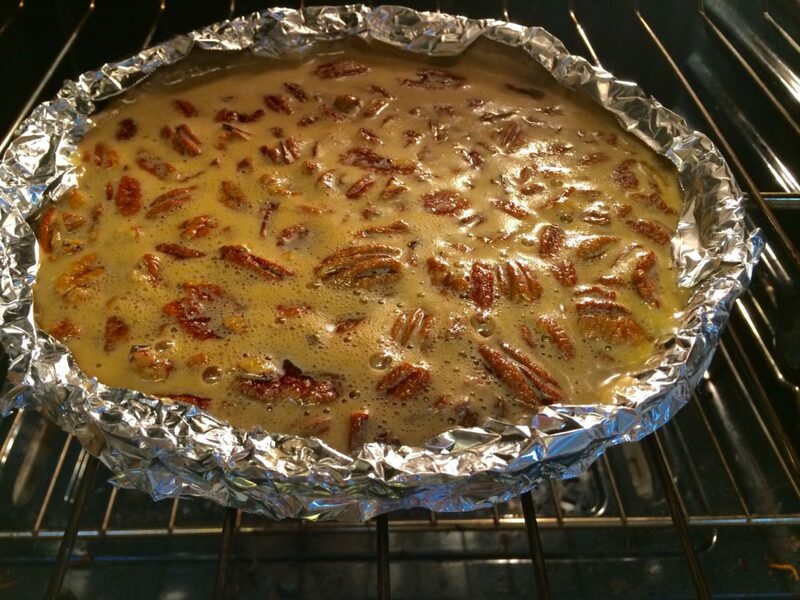 Rest the dough in a rectangular shape if using it to wrap meat or inserting into a rectangular pastry tin. Blind Baking: Some recipes will call for blind baking. This is usually the case when making a pie or tart in which the filling also needs to be cooked. It’s to ensure that the crust doesn’t come out raw. 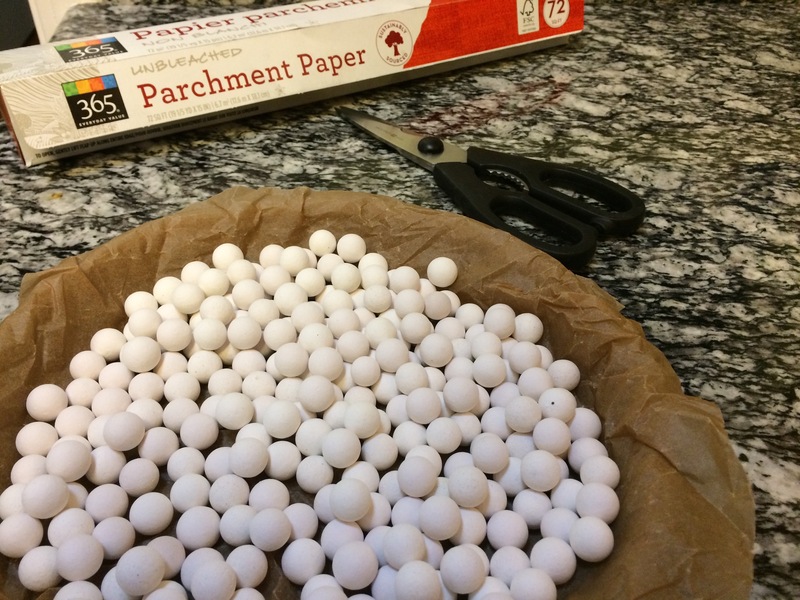 I’ve found that the best way to blind bake is with parchment paper and pie weights. Roll out the parchment paper so it completely covers the pastry form. Crumple it up like you’re going to throw it away, then un-crumple it to place it in the pastry form (this will stop the paper from slipping or popping out while you put your pie weights in place. After the weights are in place, cut the parchment paper around the perimeter of pastry form (just above the crust line). Don’t Burn the Crust: After blind baking, your pastry is mostly cooked. The majority of the shell is safe from burning, except for the edges which remain exposed. To prevent them from burning, simply line the crust and edge of the pastry form with aluminum foil. If you think the crust could do with a bit more color, add the foil halfway through your bake. Savory Crust: Making a savory pastry? Use these same methods with my basic savory pastry recipe.